"SUMANTHRA! ", Dasaratha said, "My Ramachandra is an unshakable hero; he will not turn back. His resolution cannot be shaken or suppressed by any one. Efforts made for modifying it will be futile; and, we will only be causing him distress by our attempts. Besides, Rama is an unswerving adherent of Truth. Do not delay, for if even a little time is spent in getting the chariot ready, you may miss his trail. My subjects cannot bear the sight of Rama walking along the royal roads of Ayodhya. Go, go!" The Emperor hurried him out, with the words, "Carry with you in that chariot, a few hampers of food and a few weapons and give them over. Sumanthra! I forgot to tell you this. Plead as strongly as you can, mention also that I told you to pray that Sita be directed to return to Ayodhya. Take them into the chariot, and let them go with you some distance towards the forest. Go into the forest along with them, for, if Sita is frightened at the sight of the jungle, and you become aware of her fear, immediately ask Rama for orders, and pray Sita, the tender Princess of Mathila, to return to Ayodhya, bringing to her mind that it is also my wish. Tell her that, if she cannot agree to stay in Ayodhya, the Emperor will arrange to send her to her father, Janaka". Dasaratha repeated these words often, and laden with grief at the pictures they evoked, he lost consciousness and rolled on the ground. Rising soon, he exclaimed, in great distress, "Sumanthra! Why waste words and time? Bring my Rama, Lakshmana and Sita before me now; let me have a look at all three. Decide on doing that, and make me happy." Then, he plaintively- requested Sumanthra, "Go fast, don't delay, take the chariot to where they are and drive the vehicle as far as it is possible for it to proceed, to the spot beyond which it cannot go. Perhaps, it may be possible to journey in a chariot for three or four days. At the end of that period, let them alight; stand there watching them, until they move beyond the reach of your eyes, before you turn back to bring me the news of their health and safety. Now, go. Don't stay near me. Go." Dasaratha asked the Minister to hasten. Bowing his head in acceptance of the Emperor's order, Sumanthra fell at his feet and got the chariot ready. He caught up with Sita, Rama and Lakshmana, who were going along the City roads on foot; he told them what the Emperor had spoken to him; he had them seated inside the chariot; then, he drove off in the direction of the forest. On both sides of the Royal Road, masses of citizens were weeping and wailing, and Sumanthra tried to exhort them to control their emotions, and be calm. They crossed the City limits and moved a little distance further. The populace from the Capital ran behind the chariot, all in one panic-stricken mass, raising clouds of dust that reached the high heavens. There was no sign of road or ground; It was one vast plain of distraught humanity. Old men, women, men young and strong, Brahmins, all with one voice, screamed amidst sobs, "Rama! Rama! Take us with you! Don't leave us behind!" The streets of Ayodhya were empty; the City was as silent as a City in sleep. Darkness fell, like a heavy weight, on every roof. Some men and women who could not travel stood like stumps, helpless on the road. Many bolted doors and spent the days suffering utmost anguish; avoiding food and drink, rolling on the floor, in whatever place they were when Rama left. Some awaited the return of Rama at nightfall, hoping that he might be induced by compassion to come back to his beloved people. Meanwhile, Dasaratha had himself seated in a chariot! He shouted aloud, "Rama! Rama! ... Sumanthra! Sumanthra! Stop that chariot! I will look at the treasure of my Love, just once." He quickened the pace of the horses and came faster and faster. The mass of citizens following Rama were caught between his chariot and the chariot of the Emperor, and many of them were so exhausted that they fell on the ground. When they saw a chariot passing by with speed, they raised their heads to find out whether Rama was returning seated in it; they rose and tried to stop it, to have a glimpse of Rama, their beloved Prince. But, when the groans of Dasaratha fell on their ears, they too broke into sobs; they allowed the chariot to pass pleading pathetically, "O King! Go soon, go and bring back our Ramachandra!" Dasaratha saw the chariot of Rama speeding along the sand-dunes outside the City, and, he cried out, "Sumanthra! Sumanthra! Rein in. Stop", and himself commanded his charioteer to speed up. Sumanthra cast his glance back and espied the chariot following his. He told Rama, "Ramachandra! Father Dasaratha is behind us; I feel it is best to stop for a while and find out what his orders are." Rama too saw the huge muss of citizens, and the chariot carrying his father, fast hastening behind him. He knew that if he stopped now, they would surround him and break into uncontrollable grief, that those who sat exhausted on the sides of the road would rise and race, impelled by a new hope, and so, it would be only an act of greater cruelty on his part, for he would be giving them hopes without any benefit. It will also injure the realization of his promise. If the subjects witness the wailing of Dasaratha, it will bring him down in their estimation. Weighing all these considerations in his mind he told Sumanthra who was his charioteer, that there was no need to stop the vehicle. He said, it was best that he drove it even faster. At this, Sumanthra prayed, with folded palms, "Rama! I have been ordered to be with you for four days only. After that period, I have to return to Ayodhya, haven't I? On seeing me, he will certainly reprimand me for not stopping the chariot, as commanded by him. What shall I tell him in reply? Kindly keep me with you, throughout all the years of exile in the forest. I shall deem my life well and happily lived if I am allowed to be in the forest with you. If you agree, I shall not stop; I shall drive as fast as you wish. Kindly communicate your order on this". Rama thought about the problem presented by Sumanthra and its implications. He said, "Sumanthra! He who ordered you to get into the chariot and take us in it, right into the forest, as far as it could negotiate, was your Master, the Emperor. He who now follows this chariot, weeping and pleading with you to stop, is Dasaratha. You have to listen to and obey the command of the Emperor, not the orders of Dasaratha. You are the Minister of the country, of its Ruler; not of an individual named Dasaratha. As individuals, between us, there is the bond of affection that ties the son to his father. But, as Emperor, he has imperial authority over you and me, equally. Your loyalty and my loyalty towards him are the same. You have to carry out your Duty. When Dasaratha chastises you for not giving ear to the request he is now making, tell him that you did not hear him; it is not wrong to say so." And, Rama asked him to drive faster, without caring to stop the chariot. Sumanthra drank in with avidity the nectar of moral analysis that Rama had vouchsafed to convince him. When Dasaratha saw that Rama was driving on, he stopped his vehicle, and turned back towards Ayodhya, moaning his lot, and wailing aloud. The people, however, followed the chariot, undaunted by physical exhaustion, urged on by their determination to hold on to their beloved Rama. Some of them who were ready to sacrifice their life for him and die in their effort to reach him, trudged along, breathless and broken, their feet devotedly stepping on the track left by the chariot in which he sat. Rama saw those subjects of the realm trekking behind him, drawn by the Love they bore towards him; he was filled with compassion. He stopped the chariot, and spoke to them sweet and soft words that touched their hearts. He discoursed on the various moral aspects of the situation, and pleaded with them to return to Ayodhya. They replied that separation from him was unbearable agony for them that they could not reside even for a moment in an Ayodhya wherein Rama was absent and that they were prepared to die in the forest rather than live in Ayodhya! While many among them asserted thus, the younger among them declared that a City wherefrom the Divinity of Dharma had disappeared was more horrible than the jungle, and that they could not live in such a frightful place. The forest where you reside is the Ayodhya for us, they said. Do not be worried in the least, about our exhaustion or our travail. Observe your vow, your duty as you have resolved; we too shall observe our vow. You have decided to honour the wish of your father as a sacred duty; we, too, have a sacred duty, to honor the wish of the Rama in our hearts, the Atma Rama, our Master, the Authority we loyally revere. We will not falter in our resolution. We will not return. Death alone can defeat us," they announced, amidst sobs and tears of despair. Rama felt that it was best to persuade them, by whatever means, to return home. He consoled them, sympathized with them, reminded them of the rites and rituals they had to perform every day and the consequences of non-observance. He described the horrors of forest life and the handicaps they would encounter when trying to live there as hitherto, and advised them to perform the rites and rituals correctly and without break, so that his years of exile may pass off quick and smooth; they would be helping him to spend his exile in peace and joy, and to return to Ayodhya at the proper time, fresh and fine. The Brahmin youths present before him could not be convinced by these arguments! Rama pleaded with them, saying: "Your aged parents will miss your devoted service; it is wrong to leave them unaided and alone". At this, they said, "Rama! Our aged parents are so weak and dispirited that they cannot follow you to the very forest; they came thus far and turned back, pouring their mental anguish in streams of tears. They have directed us to follow you, and be with you, for, they said, 'We are too weak; you are strong and young; Go! Serve Rama on our behalf'. Those aged people are distressed more because you are away from Ayodhya than because we are away from them. They will be happy that their sons are with Rama, a fortune they could not enjoy. Take us with you for this reason at least, to shower joy on those aged people". Praying thus, they fell at the feet of Rama and wept. Rama was struck silent at this sincere expression of love and reverence. He was thrilled by the spirit of renunciation of these young men which he felt was grander even than his own renunciation of the throne. His joy was not unmixed with a sense of pride at being surpassed by his subjects in filial piety. Darkness descended on the earth, while the pleadings and rejections were going on. So, Rama asked them to take rest and refreshments for the night, rather than trek back in the darkness. In order to encourage them to do so Rama bathed in the Thamasa River which flowed by, partook of a meal of roots, tubers and fruits, and rested awhile. The people who had followed him over long distances were so tired physically that after the meal, they fell into deep undisturbable sleep. Rama knew that, on waking, they will all insist on accompanying him; so, he woke Sumanthra up and directed him to get the chariot ready without the least noise and drive the vehicle so that its track may not be recognized. Sumanthra recognized that there was no other way; he drove so that the tracks were confusingly complex, and even gave faint indications that the chariot had turned towards Ayodhya itself! After skillfully laying these tracks, he drove forward in the direction of the forest. The new day dawned! The citizens of Ayodhya rose and looked around. There were no signs of the Royal Chariot! Nor were Sita, Rama, or Lakshmana in evidence. They were thrust into deep agony; they aroused the sleeping; they sought to trace the wheel marks on the ground. They ran wildly in all directions, seeking to spot the vehicle. One among them said, "Brothers! Rama saw how tired we were, how we were sleeping out of sheer exhaustion; so, He left this place without taking us with Him." Then they started blaming each other, for showing signs of exhaustion and inducing Rama to leave them and go alone. Others condemned themselves as inferior to fish; for, they said: "Fish cannot live without water, but, we are alive, though Rama has left us stranded". "Fie, fie, on our lives", they cursed. "We have brought on ourselves this separation from the Person dearest to us. Why are we not bringing upon ourselves Death, which will end sorrow, they moaned. But soon, they felt that since the Atma (Self) in them is Rama, the act of Atma-Hathya (Self-destruction) was unthinkable. It was also not a meritorious act. And, suicide can succeed only when one's destiny is to die by one's own hand! So, another among them suggested that they could pray to Destiny to sanction that kind of end for them all. They got involved in these pathetic discussions and doubts. They were anxious to decide soon on the next step they had to take. Before long, someone announced that the tracks left by the wheel, were traced. It was good news indeed! For, the tracks showed that the Chariot had proceeded towards Ayodhya! They followed the track for some distance; but soon, they could not be seen any longer. They had faded out. It became impossible to guess what had happened; so, they returned to the City, their thoughts all in a mess. Many consoled themselves, saying that Rama would certainly return to the Palace, for he had seen their plight and his heart was full of compassion towards the broken hearted. Rama would return before the lapse of two or three days, they said. The women entered on various vows and types of worship in order to propitiate the gods to persuade Rama to return to his subjects. People lived thereafter like Chakravaka birds which have no lotuses to live on, since the Sun is absent and lotuses would not bloom without its warmth. While the people were suffering thus, Sita, Rama and Lakshmana reached the outskirts of the town of Sringivera, with Minister Sumanthra. Rama noticed the river Ganga, and immediately directed Sumanthra to stop the chariot. He alighted and prostrated on the bare ground before the Stream of Holiness. Sita and Lakshmana as well as Sumanthra got down and did likewise. Rama told the others that Ganga was the source of all the wealth and prosperity, all the peace and plenty that shone around. Ganga gave all beings Supreme Bliss and the Highest spiritual boons. Then they decided to bathe in the Holy Waters. Rama directed Lakshmana to find some place where Sita could get down from the bank to where she could safely take bath. The banks of the river were soft and slushy in the jungle area; so, Lakshmana chose a spot, which he reinforced by placing stones and rocks so that she could descend safely and ascend in comfort after her ablutions. He prayed to Sita, the Mother, to use that temporary ghat for her bath. She took great care, while stepping down; and before she entered the river, she too prostrated to the Goddess Ganga. Lakshmana went into the jungle to gather some edible fruits so that Rama and Sita could recoup, with some food, after bath. He offered them, reverentially, and they partook of them. Meanwhile, a few boatmen could be seen collected there. Their eyes fell on the Royal Chariot, as well as on the princely forms of Sita, Rama and Lakshmana. They inferred that they must have arrived at that place on a picnic. So, they hastened to their chieftain, Guha, and informed him that some Royal Visitors were near. Guha sent a messenger to inquire and ascertain who they were and what their purpose was, in the forest, by the shore of the Ganga. He brought back the information that they were none other than the sons of Emperor Dasaratha, and that the Princess was Sita herself, and that they were accompanied by the Royal Minister, Sumanthra. Guha felt that the supremely delightful moments should not be enjoyed alone! He informed his kinsmen and comrades and friends that the great Prince, Rama, had come to the Ganga with his brother and wife. He collected fruits and flowers in plenty, and the entire party proceeded in reverential humility towards the Ganga. Guha placed the fruit and flower offerings at the feet of the Royal Visitors, and fell at the feet of Rama. His kinsmen and friends also prostrated before Rama. Watching the joy that thrilled them, Rama called Guha near and inquired of him how they fared and whether they were all happy and peaceful. He asked the chieftain Guha how far his administration was helping the community to prosper. Guha answered, "Lord, Rama-Chandra! Beholding your Feet, we have all derived limitless Ananda. We achieved this great good luck only through the merit accumulated by us, by good deeds in the past. Or else, can we, who spend our days in this inaccessible forest, ever hope to be blessed by your visit and the Darsan of your Lotus Feet? From now on, this region is certain to enjoy plenty and peace, for your Feet have trodden this soil. There can be no doubt on this, the transformation is bound to happen." Lakshmana, Sita and Sumanthra noted the sincere expression of his joy and the tears of Ananda. They were astonished at his devotion, humility and wisdom. Meanwhile, Guha held fast the Feet of Rama and said, "Lord! All this is yours; all the riches, territory, and authority that I have as Chieftain, as well as all my subjects are yours. They are awaiting your commands; they are at your disposal, usable for your purposes, your services, I am your servant. Accept me as such, accept all that I am offering and enter the City where we dwell." When Rama heard this prayer, he smiled and replied, "Guha! you are a staunch devotee; you are deeply virtuous. Your heart is very pure. But listen, I have to roam the forest as an exile, wearing the habiliments of a hermit, in obedience to the command of my father. I should not step into a town or city. I must take only the food prescribed for monks engaged in austerities. I have to live in accordance with regulations laid down for ascetics doing thapas. For these reasons, I am unable to fulfill the wish that you have expressed now." Hearing these words, Guha was stricken with sorrow. The large gathering of people who had come there from the city, Sringivera, whispered among themselves about the divine charm of Rama, Sita and Lakshmana. One of them wondered how the parents of those lovely brothers and that angelic lady could possibly exile them into the forest. "How could their tongues ever pronounce such a sentence?" At this, another retorted, "Keep quiet, you fool! Those parents have really done good. Had they not spoken that sentence, we could not have feasted our eyes on their Divine Forms. This day, our eyes are enjoying a rare festival." This filled many with satisfaction and joy. The Nishada tribesmen who comprised the gathering spoke among themselves words of worshipful admiration of the royal visitors. They extolled the beauty, the tenderness, the soft sweet natures of Sita, of Rama and Lakshmana. Guha was immersed in sorrow that he had lost the fortune of welcoming Rama into the capital City of the Nishadas, whose chieftain he was. He felt that even if the City, was 'seen' by Rama, even if his eyes glanced at it once, it would be blessed with peace and prosperity for ever; so, he suggested that Rama should walk up towards a gigantic but gorgeous Simsupa tree that grew near by and Rama agreed. Guha knew that Rama's eye had fallen on the City from that spot. He was pleased at the thought. Rama too was happy when he saw the City from a distance. He allowed the Nishadas to touch his feet and directed that they should return to their homes, since nightfall was imminent. Then Rama went through the holy rites that had to be observed at dusk. Meanwhile, Guha gathered quantities of soft grass and tender leaves, and prepared soft beds. He sent his subjects to collect tubers and fruits, tasty and fresh, from the trees and creepers of the forest, and to bring them packed in leaves, for being offered to the distinguished visitors. Sita, Rama and Lakshmana as well as Sumanthra partook of the frugal meal, and retired for rest and sleep. Sita slept on the soft bed of grass. Lakshmana sat at the Feet of Rama, in order to massage them tenderly, to relieve the tension of exertion. Rama realized that Lakshmana would continue the service, so long as he appeared to be awake; he desired to induce him to take rest; so, he pretended as if he had gone into deep sleep. At this Lakshmana feared that any further pressing of the feet might disturb the sleep, and he quietly slipped into the distance. There, he sat in the 'hero' posture, so that he could gaze intently at the four directions, and recognize at once any wild animal approaching the spot, or any demon or demonic person bent upon disturbing the sleep of Rama; he was all attention and vigilance. Seeing this, Guha too instructed his faithful lieutenants to guard the area and ensure that nothing happened to disturb the sleep of Rama. He put on his shoulder the pouch of arrows, and holding the bow in readiness, sat near Lakshmana, eager to share his vigil. Guha, his eyes filled with tears, held his palms folded before him, and asked him, "Lakshmana! The Palace of Emperor Dasaratha is, I guess, grander and more magnificent than the Divine Mansion of the Ruler of the Gods, Indra. In that Palace, everything is charming and beautiful; everywhere there is fragrance and sweetness; soft feather-beds and lamps embossed with precious gems, add to the grandeur and comfort of the palace. There, the beds have sheets light and white like froth on fresh milk, and pillows to match. Sita and Rama who used to sleep on such luxurious beds are now lying on a grassy heap, with no coverlet or pillow, sleeping through sheer physical exertion! It is insufferable agony for me to contemplate this scene. There his father and mother, his aids and maids were looking after his needs and comforts in various ways. Sita and Rama who lived royally until yesterday are now lying on the ground! Alas, my heart is torn to pieces by grief. "Sita is the beloved daughter of the world-renowned Emperor Janaka; yet, now, she is lying on a spread of dry grass. What a strange turn of fate is this! Are Sita and Rama fit for life in the forest? O, it is now being proven true that the consequences of one's acts are binding, in spite of everything else. "Kaikeyi is the daughter of the King of Kekaya State. No one can believe that she is capable of this atrociously sinful act. These two are at a period of their lives when they have to be happy together. What a reprehensible act is it to inflict on them this hard sentence! Such a fate should not overtake even one's worst enemy. "The Kekaya Princess has proved herself to be the axe that would cut asunder the very roots of the Tree of the Solar Dynasty. Her selfish greed has sunk the world in sorrow. Ah! My horrid eyes are destined to look on this pathetic sight! What despicable sin did I indulge in to deserve this punishment? Whose happy life caused my eyes in the past to become red with envy, that I had to see my beloved Rama in this plight?" Guha wailed thus; unable to stop the onrush of the surging waves of grief, he kept his mouth shut, and sat with head bowed in irrepressible agony. At this, Lakshmana too was plunged in gloom. Lakshmana gathered some courage and said, "O! Chieftain of the Nishadas! One does not get happiness through another, nor does he become miserable through another. He cannot get good fortune or bad fortune through another. There is no possibility for such indirect means to succeed. Nor can one really be either happy or miserable. Each one comes for some purpose, urged by the potentiality of his acts in the previous birth or by some Sovereign Will and Resolution. And, in the course of fulfilling that purpose, they appear to be happy or miserable, that is all. A beggar dreams that he is a king; a king dreams that he is a beggar. When they awake, they find that the happiness and the misery were unreal and short-lived. So too, the world is a dream, unreal, illusory. It is Mithya. You feel sorrow because Rama is in this plight, but Rama is above and beyond grief and joy. For those who watch him, according to the good fortune or misfortune as decided by the merit or demerit acquired and accumulated, he may appear to be happy or miserable; what you see as joy or grief in Rama is only the reflection of your own mental state." At this, Guha calmed himself, and gave up the rage he had directed against Kaikeyi, a little while ago. He understood that it was not proper to find fault with another and assign blame. "People are all laid up in the sleep of delusion. And, they are engaged in witnessing a variety of dreams. This is the way men spend the night called 'life'; the Yogis, self-mastered people, they alone keep awake in the night, without being caught up in or enchanted by dreams. They have no use for the world and its contents. They have turned away from all sensual pleasures and entanglements. Until this stage is reached, people cannot refer to themselves as 'awake'. When Jnana is attained and the Reality is realized, then the bonds of delusion fall off, and Love is fixed on the Lotus Feet of Sri Rama". Guha's thoughts ran on in this strain. He was comforted and strengthened by them. The rest of the night was spent by Guha and Lakshmana, narrating to each other the super-human attributes of Rama and the fullness of the Glory that was latent in him. Collecting food in the forest. Meanwhile it was dawn; while one of them stood guard where Rama slept, the other finished his morning ablutions and returned. Soon Rama moved his limbs, rubbed his eyes, and sitting up, looked at the four quarters. He awakened Sita, and both wended their way to the river Ganga. After bathing, and completing the morning rites, they came to the place where Guha and Lakshmana were. Rama directed Lakshmana to bring a quantity of the milky juice of the ficus tree. Lakshmana moved off without murmur into the forest near by, and without much delay, he brought with him a leaf-bowl full of the juice. Rama applied the juice to the locks of hair on his head, and they turned into a thick matted lump, the like of which is generally worn by hermits. Looking on at this act, Sumanthra could not restrain his sobs. He was shocked that the head which had to wear the jeweled crown was now carrying the burden of matted hair. He lamented that his eyes were destined ever to see this tragic sight. His heart was scorched by agony. "I cannot be with you any longer in the forest; it has become impossible. I have accomplished the orders of the Emperor. Fate is cutting short my stay in your presence. He ordered me to take you in the chariot until we arrive on the banks of any holy river, and then leave you there and return. I have the duty to inform you this fact; now, It is your turn to tell me what I have to do," said Sumanthra, standing before Rama, with head bent in sorrow, in humility, tears flowing freely from his eyes. "Do not grieve", Rama said, "Accomplishing the orders of the Emperor is your duty, and mine too. I am very happy that you carried out the orders he gave you. Thenceforward, I shall carry out the order that he has given me. I shall follow his directions with the greatest reverence, and in scrupulous detail. Do not delay; return to Ayodhya. My parents will be awaiting your arrival with unbounded anxiety. They are longing to hear from you the description of your journey so far. So, take the chariot back and proceed fast", he urged. Sumanthra pictured to himself the place he had to go back to. He pleaded pathetically, "O Ramachandra! Let not Ayodhya become an orphan city. The Emperor will find it difficult to hold himself together in your absence. Bharatha will find it impossible to reign." Sumanthra fell at the feet of Rama, unable to bear the weight of his sorrow. Rama lifted him up, and holding him by the shoulder, he consoled him. "Sumanthra! No principle of righteousness is higher than Truth. The Vedas, the Puranas, the Epics, all assert and proclaim this, as you know. Now, I have been assigned the task of following this supreme principle of Righteousness! What great good fortune is this! If I miss this chance and lose this fortune, I and my dynasty will earn eternal infamy in all the three worlds. Infamy will burn the righteous more excruciatingly than a million deaths and cremations. Go, fall at the feet of my father and make clear to him my determination and my joy. You must be vigilant to see that my father is not worried about me, Sita and Lakshmana." Guha and his followers heard these words of Rama, and were visibly affected by them. Without being aware of it, they started shedding tears. Lakshmana could not bear the anguish; he uttered a few words of anger and bitterness against those who had caused this tragedy. But, Rama realized his temper and stopped him forthwith. Then, he turned to Minister Sumanthra and said, "Sumanthra! Lakshmana is a stripling; do not attach importance to his words. Do not communicate them to father. Lakshmana's mind is undergoing such suffering since he has great affection for me, and since he is affected by the troubles that afflict Sita. He gave vent to such expressions, for he has a mistaken notion about those who sent me to the forest in exile. By nature, Lakshmana is endowed with very good qualities" Then, Rama began to describe the virtues of his brother. Sumanthra raised his head and pleaded with Rama about Sita. "Lord! Janaki is tender and soft-natured. She cannot brave the travails of forest life. It is necessary to advise her to return to the city, and convince her that it is the proper thing to do. She is the life-breath of Ayodhya. She is the Goddess of Prosperity for the Empire. If she cannot come to Ayodhya, the inhabitants of that City will suffer like fish in a dry tank. Let her return, and reside, as she desires, with her mother-in-law or her parents. The Emperor has commanded me, again and again, to tell you this in these very words. When you return to Ayodhya at the end of the fourteen years, Janaki could be brought from her father's palace". While Sumanthra was importuning in this manner, Rama signed to Sita, as if to draw her attention to his yearning and prayer. When Sumanthra had concluded, Rama addressed Sita, "Sita! Did you listen to the message of father? Go home and let my parents forget at least a part of the agony they feel at my separation. In their old age, they are too weak to put up with this terrible situation. So, it is very necessary that you go back with the minister to Ayodhya". Rama used various other arguments to persuade her to accept the request of father. Sita replied, "Lord! You are omniscient. You know the ideal moral conduct prescribed for each section of man kind. I have no need to remind you. Please listen for a while to my prayer. The shadow has to follow the substance. Can it be away from it? Solar rays cannot exist separate from the Sun. Moon-light cannot exist separated from the moon. In like manner, this Sita shadow cannot leave and exist after leaving Ramachandra, the Rama Moon." Then, she turned to Sumanthra and said, "Sumanthra! You are to me as venerable as my father and father-in-law. You are my well-wisher. 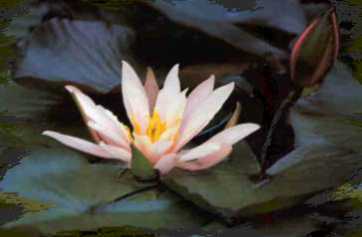 Please consider this: I do not seek any other refuge except the Lotus Feet of my Lord. The world knows that the daughter-in-law who is brought into the family cannot be any nearer than the son born in the family. That they will forget their agony at the separation of the son, if the daughter-in-law returns, is a statement that has no meaning. As regards the wealth and comfort of my father's palace, I have enjoyed them enough in my child hood days. Now, they appear to me as dry and as cheap as grass, without my Lord being with me. I have no other path, except the path which he treads. Therefore, without misunderstanding me, please agree to my words; drop this attempt to take me back to Ayodhya. Forget It. Convey my prostrations to my parents-in-law and assure them that there is no cause for anxiety about us. Tell them that Sita is happy, many thousand times happier than when she was in Ayodhya or Mithila. I am with the Lord of my heart, with the great hero, the best of warriors, his brother, Lakshmana so, I am passing these days in the forest, happily, undisturbed by fear, anxiety or agitation of mind. Tell them I am not tired in the least by the journey. Tell them I am very happy, that I consider this exile a great piece of good fortune." Hearing these words, Sumanthra was so overwhelmed with admiration and grief, that he could not look up at the face of Sita; he could not listen any more to such profoundly moving words; he could not himself find words to speak to her. He reflected on her virtues, on her pure feelings, and on her steadfastness; he deplored the fate that deprived Ayodhya of the presence and inspiration of a lady of such supreme character. He spoke to Rama: "Rama! In that case accept one prayer. Keep me too with you in the forest and allow me to serve you for the fourteen years here itself". Rama replied: "Sumanthra! You are well-versed in law and the rules of morality. You are the Minister of Emperor Dasaratha, not a minister under me. It was he who has commanded you to come back; how can I permit you to stay? Even otherwise, it is not desirable that you stay away from the Emperor at this particular juncture. You are as the right hand to the Emperor. You should not pay attention to your own Ananda and try to keep away from him; go, go to him, without further delay. If you go soon, you could give me and my parents a great deal of consolation and assurance". Rama persuaded him to go, using various other arguments and examples. Finding it impossible to resist, Sumanthra wept aloud and prostrated before the three; his steps were heavy and hesitant when he turned back; both his mind and his body were unwilling. Rama caught his hand, helped him to walk up to the chariot, and ascend to his seat thereon. Rama spoke sweet and soft to Sumanthra, as well as to the horses of the chariot, in order to induce them to turn and proceed to wards Ayodhya. Sumanthra drove the chariot back to Ayodhya. The horses were reluctant to retrace their steps; they turned back towards the place where Rama was, longing to be with him and loth to move away. Despite prodding and persuading they could scarce move on. They neighed pathetically in protest; they stopped off and on craning their necks to catch a glimpse of Rama. Sumanthra too was turning back in unbearable sorrow; he wiped the stream of tears that flowed down his cheeks; he kept his head hanging as if unwilling to show his face to men. When Guha saw the plight of Sumanthra, he was so overpowered with agony that he leaned on to a tree, sobbing, with his head pressed against its trunk. After sending the aged Minister back, Rama proceeded to the Ganga, with his wife and brother. Guha called the boatman aside and told him to clean the boat and make it fit for the Prince of Ayodhya, the Son of Emperor Dasaratha, his Consort and brother, to go across the Ganga, on their way to the forest where they intended to spend some years. The boatman had heard from his Nishada brothers the sad tale of the exile of the heir-apparent to the throne; so, he lost no time in coming over. But he had one disturbing doubt that had to be resolved. He had come to know that Rama had placed his foot on a rock and that it was suddenly transformed into a woman; was this the same Rama, or was he a different person? That was the question he asked Guha. Guha said, "My dear boatman, what a strong memory you have! I am glad you remembered that incident which happened long ago, and you have reminded me too of it!" He turned to Rama and said, with great exultation, "Rama! Listen! This man, my tribesman, this boatman has treasured in his mind your majesty and glory; he is now bringing back to my memory how you released Ahalya, the wife of Sage Gouthama, from the stone into which she was cursed. (See Chapter 7b) My subjects were very much agitated over the terrible curse that was inflicted on that lady. And, they were delighted when they knew of your Divine Power that liberated her. O, how fortunate are my people, that they are aware of your Divinity!" Guha was describing the faith and devotion of his boatman in great joy. Meanwhile, Rama moved towards the boat; the boat man stood before Rama with folded palms and said, "Ramachandra! All the years of my life have become worthwhile with the good fortune that has come to me today. The Rama of whom I had heard long ago, I am able to look upon today. That I could row you, your consort and your brother across the Ganga is the reward I have earned by accumulating merit through many previous lives. Let me pray for one blessing; Allow me to sprinkle on my head the water sanctified by washing your feet, before I row you across." Guha had not realized that his servant, the boatman was so deep in devotion to Rama. He was surprised at the request he had so humbly laid before Rama; he was supremely delighted that the man had prayed so. He said, "Listen to me, brother! Let Rama take his seat in the boat; then, you can wash his feet with the waters of the Ganga taken in a vessel; It is not good manners to wash them while he is standing on the bank." Guha reprimanded him for his obstinacy and simplicity. But, the boatman would not yield. He pleaded, "Lord! You possess vast wealth. I am helplessly poor. I am scraping together the wherewithal to maintain my family through the fees I get for ferrying people across. I find my daily income insufficient even for running my little family. How can I be happy, if even this income is lost? Therefore, please do not misunderstand me. Permit me to wash your feet, even before you step into the boat". Rama grasped the undertone of the boatman's strange request; he smiled and turned towards Sita, saying, "Did you notice this boatman's fear?" Guha could not under stand what it all meant, and why Rama had smiled. He was perplexed at the fellow's behavior. He said, "Hello, boatman! I do not understand what you are talking. How is the cost of maintaining your family related to this present duty of yours - taking Rama across the Ganga so that he might enter the forest and live there? Are you demanding more fees from Rama for this hereditary task? If so, you are only revealing your greed! In case your earnings are not enough for the support of your family, I am ready to supplement it, as the chief of this realm. Don't yearn to get it from Ramachandra. Attend to your business and get the boat ready". Guha grew angry at the persistence of the fellow. At this, the boatman submitted that he had heard people say that the feet of Rama had some peculiar power. They say when the feet contacted a stone, it turned into a woman. My boat is made by putting together many pieces of timber. If each piece becomes a woman, my Lord would leave them all to my care, for, they were born from the parts of my boat! How can I bear the additional burden? But, if the feet are washed before he places them in the boat, I can be free from fear. Besides, when I sprinkle the wash on my head, my sins too would vanish. Therefore, please permit me to have my wish fulfilled." Guha was lost in thought. But, Rama called the boatman near him, and he said, with a smile lighting up his face, "My dear man! Come, wash my feet" and he placed his feet in the palms of the boatman! His joy knew no bounds. He kept the feet within his palms and washed them both very care fully and lovingly, not missing the space between the toes, using the sacred Ganga water. Then, he sprinkled the wash on his own head, and over all parts of the boat, to guard them against malefic powers. He was immensely de lighted at the success of his plan. 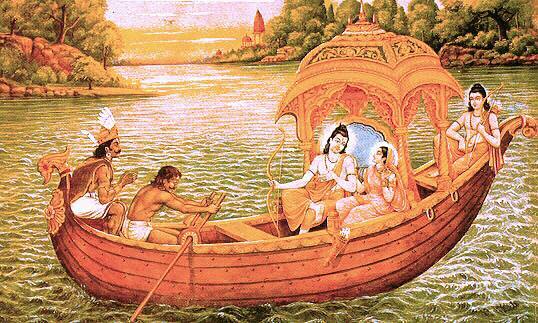 He held the hand of Rama, as he placed his feet in the boat and got in. Rama helped Sita to board the boat, holding her hand firm in his grip. He made Lakshmana sit beside him on one of the cross planks. They spoke to each other of the devotion and childlike innocence of the boatman, and enjoyed the movement of the boat over the waters. They conversed with Guha on various topics and the time passed so quickly that they found themselves on the other bank without being aware of the journey. Rama pretended to be ashamed of himself when he found he had not even a cowrie shell to offer the boatman, in lieu of the fees due to him. Sita knew the feeling of her Lord's heart, by instinct. She removed a ring from a finger of hers and placed it in the hands of Rama. Rama hailed the boatman and said, "Here, Boatman! This is your fee. Take it." The boatman fell at the feet of Rama, exclaiming, "O Rama! This day I achieved the gift of gifts. All my sins have been mashed into dust. I am liberated from the awful doom of birth and death. The pangs I endured for many lives on earth have borne fruit; my God has blessed me; my fore fathers and my progeny have been freed from sin by this blessing. Lord! Enough for me if I receive and deserve your blessings. And, when you return, O Lord! come this way, and confer on me the chance to do this service. That is the reward I value most in life." He fell prostrate on the ground before Rama, with tears rolling down his cheeks. Rama and Lakshmana consoled the boatman and tried to assuage his ecstasy. They attempted to persuade him to accept the gift. But, the boatman protested, saying, "If I accept fees for taking you across this tiny stream, tell me how much are you receiving as wages for taking generations of my line, and billions of my fellowmen across the vast and terrifying ocean of Samsar which involves all beings in the fast moving current of change. I am immersed in Bliss since I got this chance; please do not bind me further by forcing me to accept wages for this lucky chance that fell my way." These words touched the heart of Rama; he felt that it would not be good to put pressure on him. Rama blessed him most liberally and allowed him to depart. Rama and Lakshmana placed their bows and arrows on clothes spread on the bank, and they stepped into the river for bath. When they finished, Sita too stepped into the sacred river and after bath, she offered prayers to Ganga, and vowed that she would return after spending fourteen happy years with her Lord and sprinkle on her head the sacred water in thankfulness for the conclusion of the exile. Then Rama called Guha near and said, 'Dear friend! I have already used for my own purpose too much of your time. Now, you must go back to your town." When this command fell on his ear, the face of Guha fell. Tears flowed down the cheeks in streams. With palms folded, he prayed, "Rama. Please listen to my words. I shall be with you for some time in the forest; I know all the paths of the jungle; I can give you useful information. I am desirous of serving you this way. Please do not say, no." Rama was happy when he noticed Guha's love and devotion, and he took him with him. Walking some distance, they rested awhile when evening fell, under the shade of a wide. spreading tree. Guha and Lakshmana hurried to sweep the area clean and make it fit for Rama and Sita to rest. The fruits on that tree were looking very eager to fall and be of service to the Divine visitors; they turned red with excitement and joy. Guha and Lakshmana collected the fruits and placed them on broad leaves before Sita and Rama. But, Rama asked his brother, "Lakshmana, can we eat these fruits without first performing the evening rites?" So, they proceeded to Prayag, the confluence of the holy rivers, which was nearby and had the holy sight, before they took their bath; Rama described to them the glories of the spot, while returning from the river. He said that the efficacy of the waters at the confluence of the three holy rivers was so potent that it could cleanse man of all the sins that tarnish his mind.